Notes: Based on the manga Captain Tsubasa: Road to 2002 by Takahashi Yoichi. 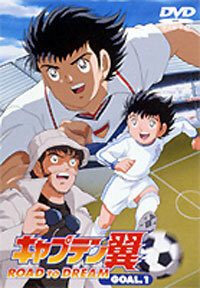 For the background on the Captain Tsubasa story, refer to the TV series review. This series is a remake of the original, telling the story of Tsubasa's childhood in flashback form while his present self prepares for the World Cup Korea-Japan in 2002. Talk about your ultimate date-check - like Yawara before it, Captain Tsubasa Road to 2002 immediately dates itself by setting a real-time goal based on a real-life event. In Yawara's case, it was the Barcelona Olympics. For this series, it's the 2002 World Cup, which was actually held partially in Japan (and in which the real-life Japanese team acquitted itself quite honorably in their best performance to date in the competition). The series starts with Tsubasa competing on a Brazilian team, while remembering his childhood in a flashback that hearkens to the original series. This is an immediate indication that, rather than a sequel, this incarnation of Captain Tsubasa is a modernization of the original, with vastly more modern animation (thoughtfully provided by the heralded Madhouse Studios). It's just as well that the animation has improved, because the story is the same as ever: Oozora Tsubasa begins early as a soccer prodigy, playing open-field ball as a little kid among older, bigger, more experienced players. But even chibi Tsubasa has a talent for the sport that can't be ignored, and that's the beginning of his own personal "road to 2002". Even without subtitles, I had absolutely no trouble following the action, which is rather straightforward anyway, and though the character designs still owe a lot to Takahashi Yoichi's original artwork and occasionally look strange to modern eyes, they are considerably cleaner and more appealing in the new version. (And Sanae is so cute!) The storytelling, at least so far, is more mature and less prone to fits of melodrama, which is heartening for those of us who don't want to feel like we're being roped into watching a "kiddie series". But is it good? Well, if you like soccer, sure! Since you really don't need to know the original to understand what's going on, Captain Tsubasa: Road to 2002 should be perfect for the anime fan who really, really digs sports. Now, we have to find a way to convince the industry that such a fan actually exists. Hmm. Recommended Audience: Again, this series is no more and no less violent than actual soccer. A little more mature in storytelling style, but fine for kids. Perhaps better for kids that way, come to think of it.